We can never have or give too much love, right?! I'm so grateful for the love and support of my wonderful husband that I'm sure I'll be giving this card to him in the very near future. I used the Paisleys & Posies stamp set to create the background but stamped more of the paisleys and less of the posies for a masculine look. 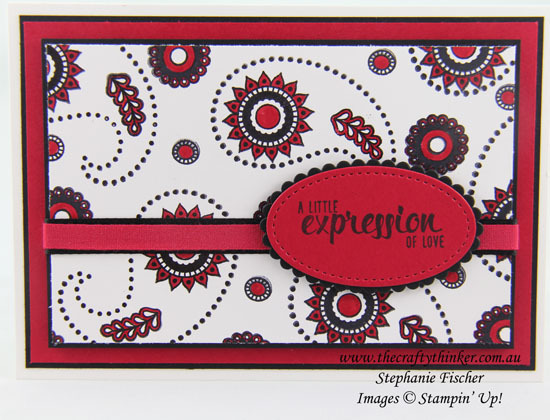 I stamped with Basic Black ink and coloured with a Real Red Stampin' Write Marker. The greeting is from the Painter's Palette stamp set and I cut it out with one of the oval Stitched Shapes framelits which I layered on top of one of the scalloped Layered Ovals framelits. The Basic Black Stitched Satin Ribbon and Real Red Cotton Ribbon are both from my stash of retired ribbon - for which I apologise but they were the only ones I had that did the job for this card. Thanks for visiting my blog today, there are so many amazing ideas and inspiration you don't want to miss. We know that you will love our gallery of projects made from Stampin' Up!® Demonstrators around the world! Just click on the thumb nail image to link to the blog post and get a better view and more information.